Just because the warm weather is giving way to cooler temperatures does not mean that your patio has to sit idly as the months pass. In fact, fall is a great time to take advantage of the outdoor space. There are several ways you can enjoy your backyard living area. Here are a few of our favorite ideas to extend the use of your patio into autumn. 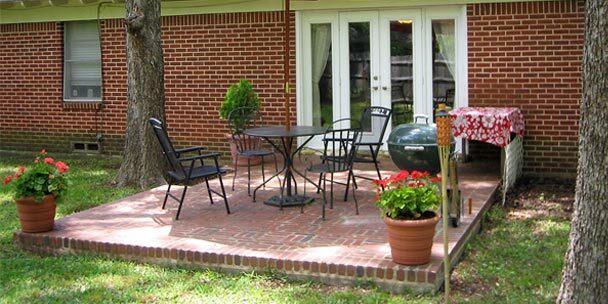 The point of a patio is to extend the living space of your home. Therefore, why not transform the area into a bit of a backyard paradise? While you can take on an expensive remodel, there are also some simple things you can do to make the space a little cozier. Add Structure: — Consider using curtains, screen tents or bamboo walls to give your space more definition. Buy or Restore Your Patio Furniture: — If your current patio set is worn down, broken or uncomfortable, you are not likely to spend much time outside. We would recommend taking the time to restore your patio furniture or splurge on something you will actually enjoy. No matter how you go about it, having the right furniture is essential. Add an Outdoor Rug: — Another way to keep the space warm and colorful is to get an outdoor rug to serve as a barrier between the cold concrete pavers and your feet. This extra splash of color is a simple – and cheap – way to make your patio more cozy. The more inviting you make your space, the more likely you will be to use it. If you are considering purchasing new patio furniture, consider how often you entertain and what kind of seating you may need. If you enjoy having guests over often, you may opt for more than the standard four seats or get extra benches. One of the main reasons people enjoy having a patio is because they want to be able to entertain guests outdoors. Cooler weather can pose a problem for homeowners who are ill-equipped. To battle the issue, consider purchasing an outdoor heater to help you generate warmth and stay comfortable. From table-top to wall-hanging, there are many different types of heaters that will keep you and your guests warm on your patio. Another great way to make your patio useful this fall is to install a fire pit. In addition to creating heat, you can also use the pit for doing fall activities such as roasting marshmallows. Fire pits can be free-standing, which are typically more affordable, or you can have them added into the stone work of your existing space. Fall winds can quickly cool your outdoor patio area and leave you rushing for the door. However, by utilizing proper coverage, you can keep the warmth in and the cold weather at bay. Consider a canopy or other enclosure that has transparent or screen doors and windows that permit you to enjoy the view but not the cold weather. You might even consider making a portion of your patio permanently screened-in, though this will cost significantly more than a temporary solution. A sure sign of autumn is that the days get shorter, and nighttime comes sooner and sooner. As daylight fades, you may be inclined to head indoors unless you have properly outfitted your backyard space with the right lighting scheme. Depending on the theme of your space, you may choose to play with tiki-style lighting or even overhead appliances. For a fun look, consider stringing lights around the space, which works especially well if you have a deck or other structure to support it. Just about anywhere you live, there are a number of vegetable plants that thrive in the fall. You can take advantage of your patio space to try container gardening, which not only adds some color to the area but also gets you to spend more time outside. In the North, planting should be done by August, but many places in the South and West can tolerate planting through September. You can also take advantage of nurseries that sell baby plants, which you can safely transfer into containers on your patio. Fall is often a time that people move plants indoors, but there are many species that thrive in cooler temperatures, even blooming during autumn. For example, joepye weeds will bloom up until the first frost. They can be planted along your patio, as they can sustain full sun or partial shade, though they should have some type of shelter from harsh winds. If you are looking for an easy annual you can plant once and enjoy every fall, try zinnias. They will attract butterflies to your yard and are considered winter-hardy in many climates. Fall is also the perfect time to plant many winter-hardy trees, such as red maples and even fruit-bearing trees. When you add some color to your patio space, you create a much more welcoming environment. For many people, fall means football. No matter what your team is, you know exactly where you will be at game time: Either in the stadium or in front of the television. Unfortunately, being glued to the TV often means missing out on beautiful fall afternoons, courtesy of Mother Nature. There are now plenty of televisions that can not only be used outside, but they can actually be stored out there, too. So-called Smart TVs can connect to your wireless internet so you can still access your favorite shows – including the big game – while sitting outside on your patio. There are many other outdoor appliances that will come in handy if you plan on kicking back in front of your outdoor TV. Consider, for example, an outdoor refrigerator to store your favorite beverages. There are smaller devices that are portable and easy to move around, or you can connect with a contractor to build one into your existing framework. The main point of having a patio is to use it, and there are many ways you can take advantage of it even into colder temperatures. You can create an inviting space by using the right furniture, décor and lighting scheme. Keep things warm with outdoor heaters and the right kind of cover. Bring out devices such as a television or refrigerator, or keep things simple and start planting your favorite vegetables. Put some of these ideas into practice, and you will create a space you are sure to enjoy this fall.